Does the key to minimizing catastrophic wildfires lie in pre‑colonial forest management practices? Having recently lived through the worst wildfire season on record in BC, Kelsey Copes-Gerbitz is the first to acknowledge that promoting the benefits of fire in the province’s interior forests is a hard sell. BC foresters have worked diligently – and often successfully – in the last century to supress fire, to prevent its outbreak or discourage its spread. And after seeing firsthand the threat and devastation of wildfires raging near her research area outside Williams Lake last summer, this UBC PhD student now has a visceral sense of why you might want to avoid fire at all costs. But looking back into the scientific record, and plumbing more deeply into human memory – especially through her collaboration with the Williams Lake Indian Band (T’exelc) – Copes‑Gerbitz says two conclusions are inescapable: first, wildfire has always been an integral part of the BC interior forest ecology, and second, humans have often worked with fire more successfully than they have fought against it. Copes-Gerbitz has just wrapped up the second year of what she anticipates as four years of interdisciplinary doctoral research in the UBC Faculty of Forestry. 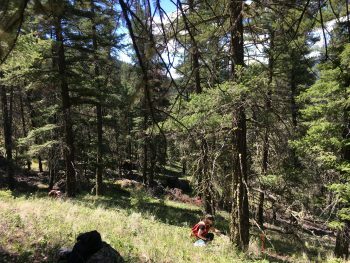 On the ecological side, she is looking at tree‑ring studies to establish a long-term wildfire record in the Williams Lake Community Forest, which is jointly managed by the T’exelc and the City. At the same time, she is working closely with community members, particularly with the T’exelc Elders, to better understand how humans have coexisted with fire over the centuries. Three things have changed. First, a century of increasingly effective fire suppression has allowed fuel to build up in the forests, so when fire breaks out, there is more to burn, creating blazes that are fiercer and run farther. Second, climate change has turned up the heat, or made the forest more fragile, for example by allowing the devastating spread of the mountain pine beetle. The third factor – less well known, but closely related to the first – is that Indigenous people are no longer managing the forests with fire. It turns out that before colonial times, it was common for people to set lots of small, strategic fires, for purposes ranging from reinvigorating berry crops to managing game – for example, by attracting caribou that find better forage in forested areas where a small fire has reduced the dense undergrowth. This doesn’t mean that anyone is planning to head into the woods with an underdeveloped plan and a package of matches, but it strongly suggests that Copes‑Gerbitz is the right person, at the right time and, perhaps surprisingly, in exactly the right place. Before colonial times, it was common for people to set lots of small, strategic fires, for purposes ranging from reinvigorating berry crops to managing game. The surprise arises because Copes-Gerbitz is, as they say, not from around here. She grew up in Hawaii, hiking the mountainside forests on the Hilo side of the Big Island. After high school, she moved to the mainland, choosing Willamette University in Salem, Oregon, because it offered her the opportunity to pursue a double major in environmental science and archaeology, reflecting a split interest in both landscapes and people. The more she felt this tension, the happier Copes-Gerbitz became about the interdisciplinary nature of her studies to date. In a single discipline – or in a forestry faculty less interdisciplinary than UBC’s – Copes‑Gerbitz says you can wind up with scientists and ecologists who are inclined to shy away from people – who are accomplished in their area of expertise, but not trained in social science research methods. But, Copes-Gerbitz says, “unless you can talk to people of all different perspectives – unless you can work collaboratively with everyone – change is going to be much more difficult to come by.” That’s why she chose to pursue her PhD at UBC, where her thesis supervisor is Dr. Lori Daniels, an expert in fire ecology who has worked hard to engage with communities throughout the province. In addition, Copes-Gerbitz benefits from the guidance of a social science methods expert, Dr. Shannon Hagerman, who has extensive experience working across the sciences in a policy context. She started to understand how difficult it is to manage the landscape in what she calls “a multi-value setting,” where you have to balance or accommodate ecological goals, economic goals and social goals all at the same time. And the move to BC has proved an excellent choice. “I’ve been loving every step,” Copes-Gerbitz says. “I’m loving the urgency of doing this kind of work.” To support it, Copes-Gerbitz applied for UBC’s Public Scholar Initiative award, which benefits doctoral students whose research is explicitly linked to purposeful social contribution and innovative forms of scholarship. She also landed a student grant from the faculty’s Aboriginal Community Research Seed Fund. Without these sources of funding, says Copes-Gerbitz, the long-term community engagement necessitated by collaborative work, and the ability to give back to the community, would have been difficult to fully realize. Copes-Gerbitz says she is less concerned about finding “a job” after achieving her degree than she is about maintaining the impact of the work she is doing already. This is not one of those projects where you can usefully drop in, conduct your research and leave with the product, she says. Even if she succeeds in developing holistic and appropriate management strategies for minimizing the threat of catastrophic wildfire, the crucial final piece will involve engaging the community, building management capacity and, most of all, building public trust. Thank you for spreading this aboriginal knowledge. It is great to read about this in an academic arena. In contrast, I feel sensitive about the truth that these age-old fire practices need an academic, Caucasian voice to be valued- which is by no fault of the writer, but a reality of the time in which we live. I respectfully ask you to consider your perspective when writing a pice such as this. It sounds very much like a non-aboriginal voice speaking to a non-aboriginal audience, which may in fact be the case; however, as an aboriginal reader I would love to see writings about aboriginals/aboriginal practices that are nuanced so they don’t “other” aboriginals. It sounds very much like Copes-Gerbitz is in a learner posture, which is brilliant. I am grateful for Copes-Gerbitz and her interdisciplinary approach that allows for meaningful partnerships. This article puts her in a saviour or “discoverer” role, which feels disrespectful of the T’excelc people, who are the vital knowledge holders. Thank you for your response – we greatly appreciate your perspective and the points you have raised. Apologies for not responding to your comment earlier – I wasn’t aware that it had been posted. I am indeed a learner in this collaborative process and as learners we are always self-reflecting on how the research itself and us as researchers are perceived by the research partners and public. To provide a bit more background on the collaboration, early discussions about the project centered around how western science can support Indigenous knowledge to co-create a synergistic understanding of fire history, that can in turn provide options for the Community Forest management. We constantly seek to maintain an open dialogue with the T’exelc, from the development of the research through the knowledge co-development process and always request input into and feedback about any public-facing outputs. We are disappointed that this relationship was perhaps not conveyed appropriately in the article, as we feel that the T’exelc are the vital knowledge holders as you mention. Note that this article was published in early stages of the research (primarily in response to the 2017 wildfires), and the knowledge co-development process is ongoing with the T’exelc Elders. We would be pleased to discuss this with you in more detail so we can potentially avoid these issues in future work. Thank you again for your insights – please feel free to contact me via email (listed on the UBC Tree-Ring Lab website). Fires caused by lightning strikes and human start s were also part of natural recycling. When forests, like other life forms get to their natural lifes end, something ends the old life..a beetle, a bacteria, a lightning strike…a man.. and we start anew. Most of it is random. It shows in viewing our landscape..the mix of many areas of different age classes and forest composition. Not necessarily due to man’s doing. We had small sparse populations who largely went with the flow of natural events. Now we have invested in infrastructure and population is large. Impact of change by natural events can be large. So, we try to intervene.. often without success. Let’s not over credit man’s influence. But recognise that we do try to learn more and do better with experience. We do improve with research. Newer is better.